Amid the maelstrom over the GST, the Senate last night passed what may be the most useful piece of legislation yet to combat multinational tax avoidance. The new law was not carried by the government, whose track record on tackling big tax dodgers has been heavy on rhetoric but light on performance. Rather, it was brought by the Greens, Labor and the cross-benchers led by independent senator Nick Xenophon – and opposed by the Coalition. It will be lamented too by a suite of global corporations who operate in this country as it is compels them to the same standards of disclosure as local companies who are listed publicly on the Australian Securities Exchange. So it was that Xenophon, Greens’ senator Peter Whish-Wilson and Labor’s Sam Dastyari led the evening’s assault in the Upper House to introduce the Tax Laws Amendment (Combating Multinational Tax Avoidance) Bill 2015 – measures to ensure that any foreign company with more than $1 billion in revenues files proper financial accounts, not the skimpy “special purpose” variety so often designed to conceal devious tax schemes. The move follows an investigation in Fairfax Media four days ago exposing the furtive shift by no less than 20 multinationals to “special purpose” reporting. 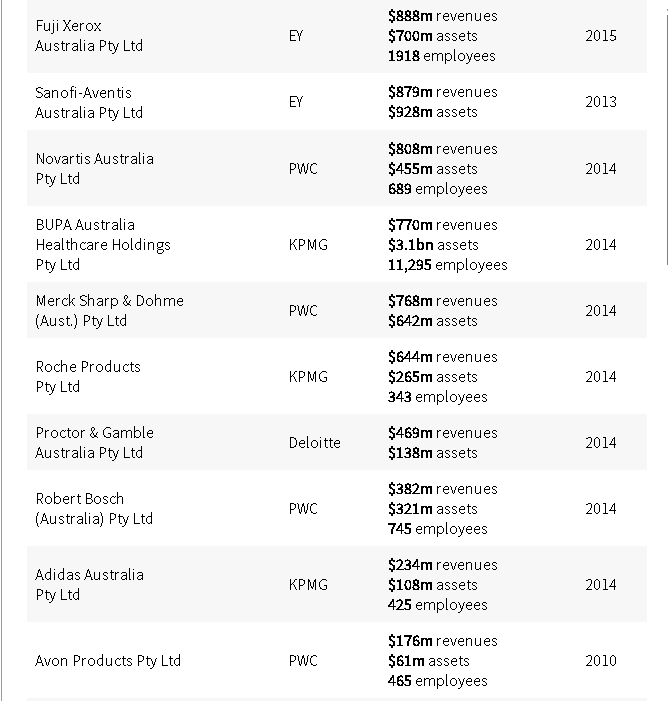 The likes of Johnson & Johnson, BUPA Australia, Unilever, Roche, Adidas, BMW, Pfizer and News Corporation had stopped providing full disclosure and, with the connivance of their auditors from the “big four” accounting firms, suddenly decided to deem themselves to be “non-reporting entities”. It was a “loophole” which had to be shut down, said Whish-Wilson. “Why do Australian companies have to provide it (full service accounts) but not Google and Microsoft?” Xenophon asked the chamber. The Finance Minister however was not happy. “The government doesn’t support this bill,” said Mathias Cormann. It was “red tape”, an “excessive compliance burden” and it was not supported by the “global experts”. Of course. 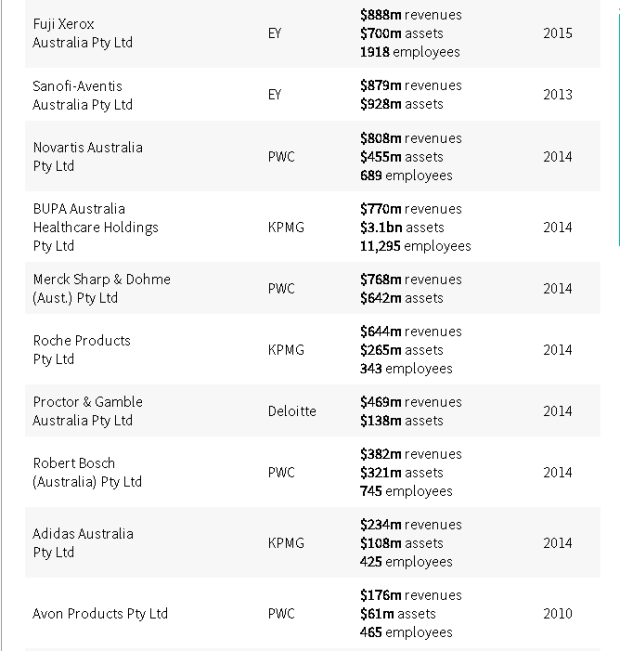 It was these very “global experts” – often from PwC, Ernst & Young, Deloitte and KPMG – who audited the multinationals, signed off on their sly shift to bush-league financial statements and raked in millions in fees while having the cheek to advise governments on tax policy. The pièce de résistance though was Cormann’s claim that this “compliance burden” was unnecessary as the information contained in full “general purpose” financial statements was already provided to the Tax Commissioner anyway. If this was the case; if the multinationals were already supplying this information, why then would it be such a burden to supply it to the corporate regulator too, not to mention their creditors, staff, local communities dependent on their economic activity or any other stakeholders? Was it unreasonable red tape to cee-cee the Australian Securities & Investments Commission on the email header? “How can it be an additional cost of compliance if it already provides this information,” asked Xenophon. “General purpose accounts are the equivalent of the financial information provided by ASX companies”. When the chair of the committee on corporate tax avoidance, Sam Dastyari, stood up to make the point that special purpose reporting was designed to shrink disclosure and that Labor would be supporting the bill, Cormann let fly. 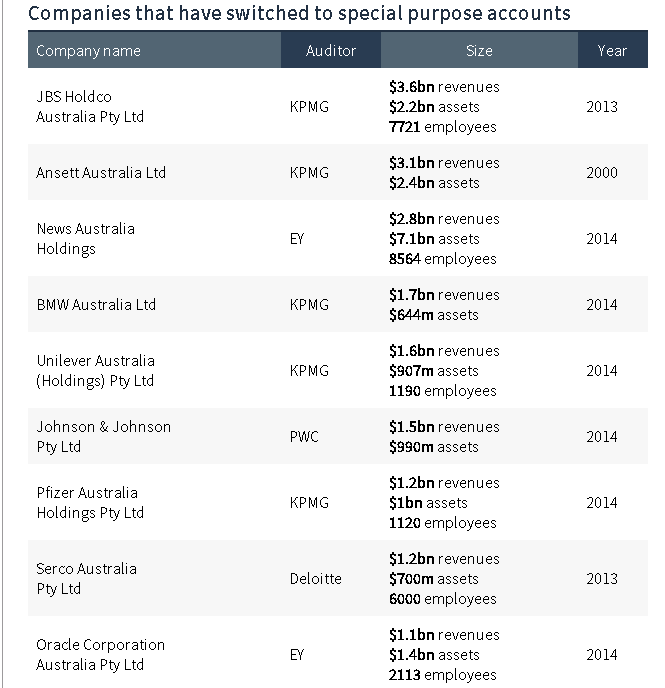 “Labor is helping to delay effective action on tax avoidance,” he thundered. “The Labor Party has put themselves on the side of multinational tax dodgers”. Hardly. As Dastyari retorted, how could simple transparency measures be bad? This was a cop-out, “a weak and embarrassing position from the government”. “It is a farcical argument,” concurred Xenophon, “to suggest that the Greens and the Labor Party are somehow siding with multinational tax avoiders”. This was hardly the “mature and informed” tax debate espoused by the government, but it was a good display of democracy in action. The bill was carried by a solid margin of 34 to 27 senators. The other bill up for debate last night, but yet to proceed to a vote, is the repeal of the government’s Tax and Superannuation Laws Amendment (Better Targeting the Income Tax Transparency Laws) Act 2015. This is an amendment brought by the Greens to nix the so-called Kidnap Bill, or as we like to call it The Rich Mates’ Amendment which effectively excuses a raft of billionaires from having to provide information about their financial affairs as it might lead to them being abducted and held for ransom. Understandably, the Greens – and Labor, and anybody much really – never cared for this bill but the last straw was revelations in these pages earlier in the week that the lobby group which had swung the cross-benches in the government’s favour was the Family Office Institute Australia. This soi-disant “Institute” was found to be perhaps the only institute in Australia which did not compose a single member. Instead, it was basically a couple of tax lawyers and a lobbyist who had teamed up a few months ago for the purpose of doing Senate submission and generally barracking for the Rich Mates’ Amendment Bill. The vote on this bill is a close run thing. Nick Xenophon may be the deciding factor on the kidnap amendment, which is heard in the Senate this morning. Both bits of legislation are part of the same law, and when it gets back to the House of Reps, they may be voted down. Even with the government’s 90-55 majority, the Coalition may agree to one or both, as it is no doubt more sheepish about helping billionaires and multinationals hide their wealth while simultaneously riding shotgun for the GST, a tax which hits lowest income earners hardest. In any case, things are finally moving in the right direction. Multinationals thrive in the shadows of corporate complexity and non-disclosure. In the aftermath of the senate hearings into tax avoidance, there has been a rise in public awareness that “Double-Dutch-Irish sandwiches” and transfer pricing schemes via “Singapore marketing hubs” are little more than sophisticated scams; that billion dollar loans at hefty rates from overseas associates are designed to rip out pre-tax profits to tax havens, that the whole racket entails making as little profit as possible in Australia where income tax rates are higher. The issue of tax fairness has come to the fore, and the Senate has begun to tackle it in the best way possible; with the disinfectant of sunlight. Transparency is the best tonic for the scourge that is global tax avoidance. Last night’s bill entails precisely this, making multinationals produce proper accounting detail about their related party transactions by enforcing general purpose reporting. These are the easy first steps, not that they have been particularly easy. From here, the way forward is to shift the tax base away from accounting profit and impose tax on revenue derived from sources within Australia and allow deductions as a percentage of global consolidated expenditure. All transfer pricing issues then disappear, all interest manipulation becomes irrelevant. The question of who owns the group’s intellectual property becomes irrelevant. The profit declared in Australia becomes irrelevant. The correct tax is paid. The Americans, the Brits and the Swiss may resent their artificial schemes have been laid bare but … too bad.